Today was the assessment day for the Coach in Running Fitness course that I started way back in March. With 3 days of training and 6 months of sessions under my belt (almost 50 hours of coached sessions and many more hours of session planning, building mesocycles and Internet trawling), I was quietly confident that I’d get through the assessment without too many issues. Many of my Saturday morning sessions have been witnessed by my excellent Support Coach Carol who has provided invaluable feedback on how to improve content and delivery and I’ve done my best to take that advise on board. Even with all that prep and the technical exam successfully completed, I didn’t sleep well last night and woke feeling far from rested. With the assessment being held at the Ageas Bowl in Hedge End, at least I didn’t have a long journey ahead. I arrived early but fortunately wasn’t the only one as two of the course tutors, Ana and Simon had also just arrived. It was good to chat with them and that helped settle my nerves which had started to build. Over the following 30 minutes, the two other assessors arrived as well as the remaining 14 training coaches. The day was divided into 2 halves. The first half would focus on the delivery of a 20 minute unit from a pre-prepared session plan. 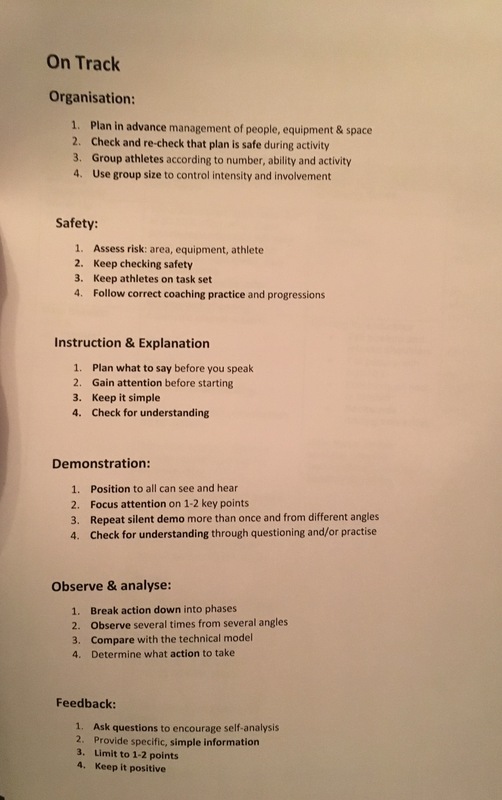 Our performance were compared to a 2-page checklist with the assessors having to witness and document how we performed against 20 or so criteria. These were essentially the key points from the ‘On Track’ cards which I’d handily typed onto one page for quick review. The afternoon would then be used to get an opportunity to deliver another unit from the session plan in order to cover any assessed elements that weren’t successfully witnessed by the assessors in the morning. We’d then have to discuss the mesocycle (8 week plan) we’d devised for an athlete, how that training had gone, any issues along the way and next steps we’d taken or had planned with the athlete. Finally, we’d discuss our future as a coach and build an action plan for ourselves with the assessor before finding out whether we’d passed or failed. The 15 trainee coaches were divided into 3 groups of 5 and we then headed out to start delivering our sessions with our assessor. As trainees, we’d only met 2 of the 4 assessors and it was a little scary to find out that our assessors was new to us. However, Paul turned out to be very friendly and positive. It also transpired later that Paul Moseley was in charge of all the coaching education and courses for England Athletics and had led the team devising and delivering the CiRF course. He was the Head Honcho! Eek! I was in a group with fellow Lordshillers trainee Martin who I’d worked with closely during the 6 months; helping review his session plans and mesocycle. The other members of the group were Clive, Deena and myself. Clive was up first and my unit was 3rd while Martin was 5th. I won’t go into much detail about that others’ units but I will say that we almost all chose ‘arm drive’ as the technical skill to focus on. This was a good choice IMO as any discrepancies from the desired ‘positive backward arm drive’ are easy to spot and address. Although with experience, we all develop of ‘coaching eye’, confidently spotting issue with foot landing or CoM is more of a challenge. My plan followed my normal Saturday morning ‘recipe’ of a warmup, tech skills, S&C circuit and then cooldown and stretches. As I was delivering my ’20 minutes of a session’ midway through the group, I chose to deliver the tech skills bit of my plan focusing on, you guessed it, a technical skill of positive backward arm drive (as well as tall posture and relaxed shoulders). This involved some visualisation, silent demos (which I find impossible), some group participation and then a short pyramid session followed by an intervention and then a longer pyramid. All went well and I was happy with how I delivered the session and the fact that I delivered the whole unit without referring to my session plan. I’d had enough practice. We were given feedback immediately after delivering the unit and my assessor had passed me on every element apart from one. He guided me to try and establish the one issue I’d not resolved during the unit but I couldn’t think what it was. Fortunately, Paul happily let me know that I’d had the group facing the sun which made it difficult for them to concentrate during part of the demoing. D’oh. As each trainee was participating in the other trainee’s sessions, we all had quite a workout during the morning. I was shattered by lunch! I don’t think I was the only one. I was just glad that I didn’t need to run my pyramid session! After lunch we headed back outside to deliver a 10 minute unit from our session plan which provided the opportunity to showcase any skills we’d not been able or hadn’t used in the morning. For me that meant making sure the group weren’t facing the sun. Again I was the 3rd to deliver and chose to include the S&C unit. I was pretty confident about that given both using S&C in my Saturday morning sessions and the dedicated weekly S&C sessions I deliver to club members. Again, that unit went well and I was happy with how I’d delivered the unit. That just left the conversation about my delivered mesocycle and discussing an action plan. Although I’ve build mesocycles for a few athletes, I chose the one I’d built for Jonathan Smith that had gone really well and the outcome of which had exceeded both of our expectations in that Jon had smashed his parkrun PB. That discussion went well and a short time later, Paul let me know I’d passed my assessment and was now a Coach in Running Fitness. He’d also commented on how I had a very natural coaching style and that it was clear that I enjoyed coaching. Can’t really ask for more than that. So, 6 months of hard work is over and I can now carry on coaching. Phew! As I’ve mentioned many times, I really enjoy coaching and am confident that I’ll continue to improve both my knowledge and delivery of sessions in the coming weeks, months and years. Many thanks to Carol and all the Lordshill Road Runners I’ve coached to date. I’m looking forward to building more interesting sessions and seeing more LRR members benefit from the technical skills I help teach them and the S&C sessions I deliver. This journey has only just started. Who knows where it’ll take me.